How Pepsi gamify the coming World Cup 2014 experience? Pepsi gamify the World Cup 2014 experience with new interactive video clip and a pinterest like website which include reward system /(points) to engage the visitors. Interlude technology was used to five all soccer fans the control power over the narrative of the clip. There are 11 instances in the video in which a user’s cursor turns into a symbol. Click on it and the video launches into a vignette that you wouldn’t see otherwise. For instance, soccer superstar Lionel Messi is shown reading a newspaper, at that point, the cursor turns into a newspaper that if clicked, changes the scene to where a crowd discovers Messi and descends on him. 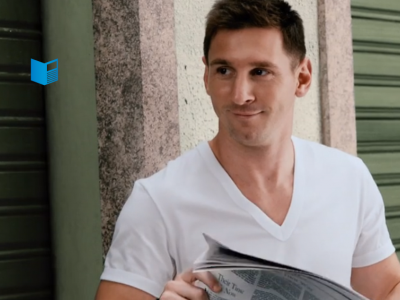 However if you don’t click, then the scene moves on quickly and Messi picks up the paper and reads it again. An extended performance of the David Bowie song Heroes by Janelle Monáe. This is a great example of using one of the strongest#GamefulHeroes powerful principals in the book: Be the clip’s Director. Story-telling and control which Interlude Tech provide, are key factors in meeting our basic intrinsic motivation engines: Competence and Autonomy which in turn, if utilized properly like the pepsi showcase, boost fun and engage the player.
? How will you create the “Gameful Heroes” experience for your players/ users?
? Do you plan to include a theme, a Story that players/ users can connect with emotionally?
? How will you provide players/ users the sense of control to meet their intrinsic motivation of Competence and Autonomy? Dr. Hanan Gazit, PhD design and study gameful experiences, video games & virtual worlds. Founder and CEO ✪ juloot interactive. A Doer, Thinker, Mentor and keynote speaker. Hanan consult leading 500 fortune companies and startups on using Gameful design for branding, marketing, sales and training to empower abilities and boost results to success. Additionally, He serves as the Israeli Digital Games Research Association (DIGRA) Chapter. Currently he is writing his first book Gameful Heroes. 2019 © juloot interactive gamification All rights reserved. Start Play your Life™ and logo are registered trademarks of juloot interactive. All other marks are the property of their respective owners.